Alejandro Narvaez walks down West Crawford Avenue as his 8-year-old daughter pedals ahead on her two-wheel bike, complete with a horn and white handle streamers. 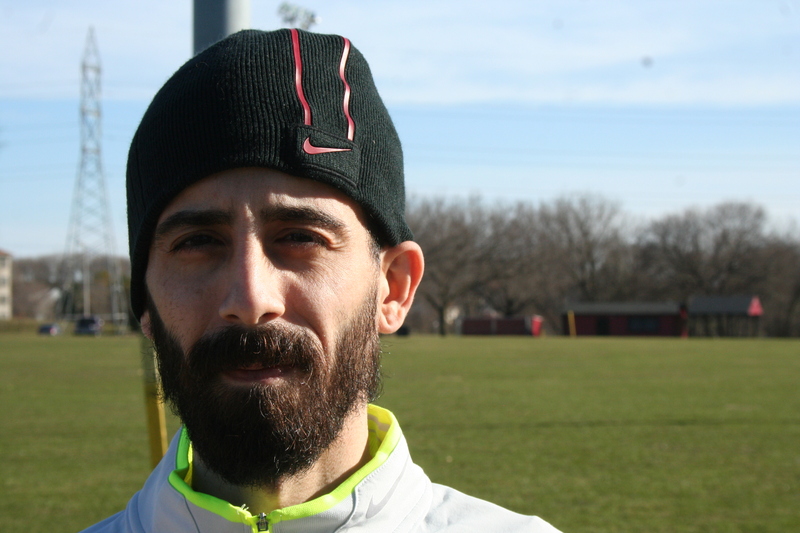 Bearded, in a Nike beanie and athletic apparel, Narvaez’s slight figure and quiet demeanor are unassuming. Alejandro grew up on the East Side of Milwaukee, near Holton and Hadley streets, but moved a lot as a kid and has lived in many different corners of the city. He spent spells on the northwest side and Wauwatosa, and lives on the South Side now. A slightly different experience came with each place — playing cops and robbers as a child on the East Side, gaining an interest in Jordans and starting to collect them while attending Madison High School later on. No matter where he’s been, though, Narvaez was immersed in Puerto Rican culture, something he wants to pass on to his daughters. But there was another side to that coin. Alejandro says a lot of his Puerto Rican friends, and some family members, were in gangs. It was one of the reasons his parents moved away from the East Side and why they eventually sent him to Boscobel, Wisconsin, to live with his uncle. “I learned how to hunt, fish, all that other good stuff up there,” Narvaez says. Alejandro has two daughters — one 16 and the other 8. As the first was on the way, he realized he had to get a job, something his ex’s father helped with. The position, at a non-destructive testing lab, turned out to be everything he could’ve asked for. Not only does he get to test everything from roller coasters to fireworks, but the owner has a philosophy that’s kept him there. But, Alejandro has still made room for his passions, like music and DJing, which he fell in love with while watching his uncle spin as a kid. Narvaez started spinning about 10 years ago, after meeting a local DJ. He was even playing some clubs downtown and on the South Side. But, after breaking up with his ex, he sold all of his equipment. That theory has been tested, time and time again. About eight years ago, Narvaez’s parents split after 30 years of marriage, a change he called “devastating.” At first, he says he was heartbroken, but there was a silver lining. It gave Alejandro and his mother a second chance at a relationship. His mother — who he calls “the glue to the household” when he was growing up — wasn’t often one to show her feelings, something he needed. They’ve taken the opportunity to mend old wounds. At this point, Alejandro’s main goal is to buy a house, something he wants to do in the next couple years. But, either way, Narvaez plans to keep it interesting. Otherwise prone to boredom, he says variety is a must.